Have you ever had “Schäufele”? Trust me, if you never had one, you have to travel to Nuremberg very soon. It is the quintessential German dish. Hearty and rich, full of porky goodness and palate tickling flavours. It is Nuremberg’s most favourite dish, although you may get it in other German cities too. But don’t just rely on my promise of good German food; Nuremberg has a lot more to offer. Read here about all the sightseeing that we did on the four days of our city trip, from Nuremberg Castle to the Nazi party rally grounds. 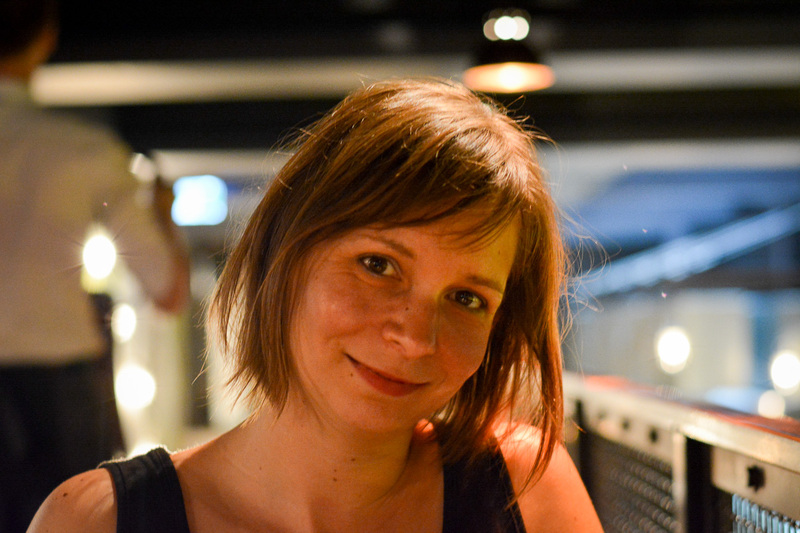 We spent four days in Nuremberg with the kids. Some parts of the city we discovered together with them, others we explored on our own. In this article, I will share all our favourite experiences, from medieval cellars the size of soccer grounds to traditional food and a touch of winter romance. I am sure you will find lots of inspiration in this post and I hope that it may convince you to add Nuremberg to your Germany itinerary! Exploring the medieval Nuremberg castle with the kids was great fun and proved to be a solid history lesson for the little ones. Nuremberg offers many great reasons why you should visit at least once in your lifetime. It is the second biggest city in Bavaria after Munich. In the Middle Ages, it was also one of the most powerful cities in Germany. And even though almost 90% of the historic city centre was destroyed in WWII, the city has been rebuilt in great parts and is really pretty to look at. The highlights of Nuremberg include sights such as the Imperial Castle, the subterranean rock cellars and the city walls. Many people will also have heard of Nuremberg because it played such a pivotal role in many of Germany’s historic moments. The Nazi party members were particularly fond of the city, because they felt it had a very German feel to it. It still does, to be honest. In the pre-Christmas season, people flock here to experience the beautiful Christmas market, one of the oldest Christmas markets in Germany. Plus, Nuremberg invented some of the best German food, most notably the Nuremberg roast sausage (three in a bun is a popular snack food that you can buy anywhere in the streets) and the famous gingerbread. In short, Nuremberg is an incredibly German city. Besides the traditional food served in the restaurants (we indulged on stuff like Schäufele, pork crackling roast and lentil soup) there is also the German National Museum as well as the Nazi party rally grounds to explore. I am usually not a big planner when I travel to a new destination. I prefer to just leave the hotel room and start walking. This is why our first day in Nuremberg started with a very casual walk of the historic city centre. And there is a lot to see here, because Nuremberg was a big city even in the Middle Ages. The stunning portal of the Gothic church St. Lorenz in Nuremberg. We started our self-guided walking tour of Nuremberg with a look at the first of three important churches in the city centre, St. Lorenz. A pretty church in Gothic style with lots of stonemasonry around the portal and an impressive looking stained-glass window between the two towers. Right behind us we found another fascinating building from around that period. It was a patrician house called Nassauer House, which had a beautiful sundial, little turrets and even a pretty bay window overlooking the square. Holy Ghost Hospital was a medieval social welfare institution which is now home to an excellent Nuremberg restaurant. We turned right and followed the pedestrian zone. We crossed the river that flows through Nuremberg, the Pegnitz, and found the next Nuremberg sight as we were standing on the bridge. Holy Ghost Hospital was founded in the Middle Ages, a pretty building that spans one half of the river. Today, the Holy Ghost Hospital is home to a first-class traditional German restaurant (the best sauerkraut I ever had). In the Middle Ages, however, it was the place where the elderly and the sickly were looked after and cared for. The Narrenschiffbrunnen, or Fools Ship Fountain, is one of Nuremberg’s best known sights. Just one of the many rather extraordinary fountains in the city! Behind the bridge, on our way to the castle, we came across the next Nuremberg sight. In case you didn’t know yet (I certainly didn’t! ), Nuremberg is home to quite a few rather strange looking fountains. The one right in front of us, called Narrenschiffbrunnen, must have been one of the most peculiar ones. Literally translated to Fools Ship Fountain, the artwork shows biblical scenes taken from the woodcutting work of Albrecht Dürer, Nuremberg’s most famous Renaissance artist. Interestingly, the fountain to this day has never had any water in it. The Golden Ring on the Beautiful Fountain is said to bring luck to those who turn it three times. On our walking tour we finally arrived at the main market square. Here we found yet another fountain, the Schöner Brunnen, or Beautiful Fountain. Pretty it was indeed, colourful and golden, with lots of little statues and details. We focused our attention on the cast iron fence around it though, as we were looking for the famous Golden Ring. This ring is said to bring luck to those who turn it three times. Noteworthy was also another resident on the square, Frauenkirche (Church of Our Lady) which has a sweet glockenspiel that sets into motion every day at noon. The Sinwell Tower is Nuremberg’s best known landmark and can be widely seen from different spots in the city. It was time for us to conquer that mountain to get to the Nuremberg Imperial Castle. We postponed a visit to the next day, however, when we would have the children joining us. 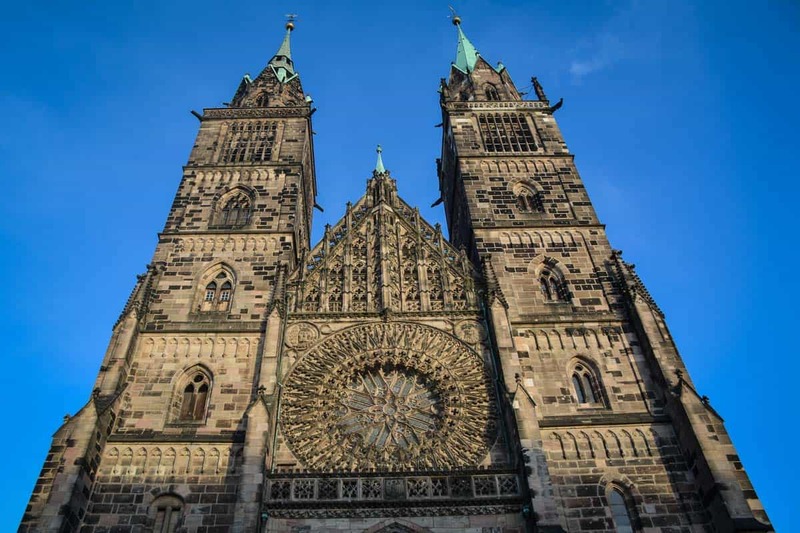 We walked past the historic town hall of Nuremberg as well as the backside of St. Sebaldus church, important sights that we wanted to inspect closer on one of the following days. Even from below we could enjoy some great views of the medieval castle which was lit up by the golden afternoon light of the winter sun. In particular the famous Sinwell tower looked amazing in the glow of the setting sun. The square just below Tiergärtner Gate is very popular in summer. Not pictured is the original house where German Renaissance painter Albrecht Dürer spent his childhood years. Just below the ramparts of the Imperial Castle we followed the road to get to the famous Albrecht Dürer House. 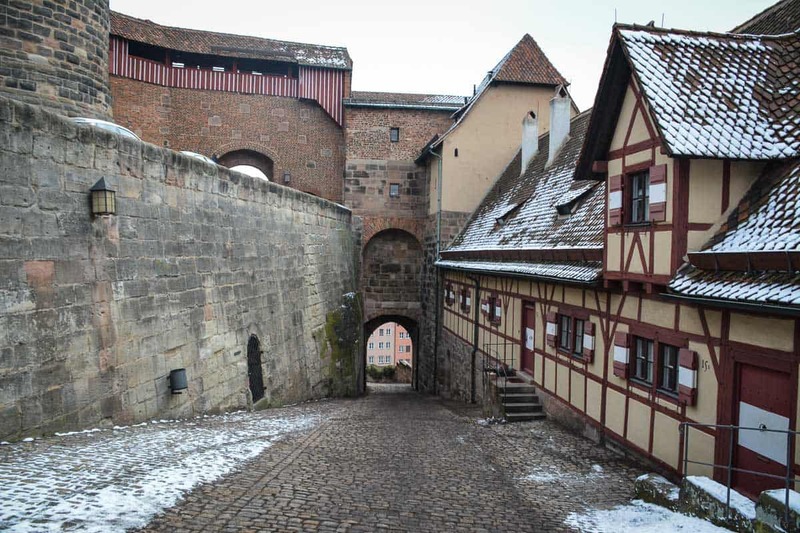 This part of Nuremberg appeared to be the best preserved. Many houses were original timber-framed buildings that stood close together with no room to spare. Thanks to the warm light of the afternoon sun we were treated to some of the best views of Nuremberg. What is interesting to know is that the German Renaissance painter Albrecht Dürer once lived in this part of town, and visitors could visit his childhood home to this day. It may not have been the prettiest house on Tiergärtner Gate Square, but it was the last remaining artist house of the 15th century to have survived in Northern Europe. Weissgerbergasse (Tanner’s Lane) was one of the most picturesque old town streets in Nuremberg with many original features. We followed the city walls until we reached a street that was rumoured to be one of the most picturesque in all of Nuremberg. Weissgerbergasse was the former center of the tanning industry in Nuremberg, home to many tradesmen and their families. Thanks to the hard work of residents and locals a lot of the medieval houses could be preserved and restored. Around 20 of these houses could be visited today on the annual Day of the Open Landmark. Kettensteg is a chain bridge which offers some of the best water views in Nuremberg. I would be introduced to my most favourite part of Nuremburg just moments later, the Kettensteg Bridge. This was the oldest chain link bridge on the European continent. Just a small bridge, no wider than one person at a time, and thus closer to the water of the Pregnitz river than any other place in Nuremberg. We crossed the bridge in the shadow of the imrpessive city wall, accompanied by the satisfying gurgling sounds of water and pampered with views of the city from across the water. Instead of showing you a picture of Nuremberg’s red light district here is a picture of our traditional German dinner. If you haven’t had Schäufele yet, make sure you leave some space in your tummy for this delicacy! It happened rather innocently that we sort of stumbled right into Nuremberg’s red light district. If you are keen to find out how it looks like, simply follow the city walls like us until you reach the section called Frauentormauer. Nuremberg’s red light district is indeed flooded with red light that adds colour to the medieval city walls. The girls, not unlike in Amsterdam, sit behind huge shop windows waiting for customers. I did a little bit of research on this, and as it turned out this was one of the oldest red light districts in Germany, established in this very location in the Middle Ages for young, unmarried men who could not afford to get married. Even though we had sort of fun there, we decided to spend the evening in a different but not less amusing way. We found good old traditional German food – rich, hearty, full of flavour – at Restaurant Bratwurst Röslein just next to Nuremberg town hall. The Imperial Castle is just one of many that were built all around Germany. In former times, kings and emperors would travel around the country to show their presence, and this is where they would stay for a limited time before moving on. On our second day we wanted to visit two of Nuremberg’s best known attractions: the Imperial Castle and the German National Museum. The Imperial Castle in Nuremberg was considered one of the most important castles in Germany. For many centuries it was used as a Kaiserpfalz, which means that it was a temporary royal palace as kings back then would travel around rather than stay in one place permanently. As such, this building had already seen its fair share of historic moments. On our visit, we first entered the great hall which would lead directly to the stunning double chapel. The double chapel was well worth a look as it was a typical element of a Kaiserpfalz, a status symbol which stressed the division of roles in medieval society. Thanks to the two-level design the emperor and his family could follow church service without having to share the space with the rest of the court. A visual and spatial division that stressed the special position of the sovereign in medieval society. Afterwards, we had a quick look at the exhibition which gave us great insights in English and German language on the history of the city and the castle. Unfortunately, we were unable to visit other parts of the castle as we were too late to join the tour of the well house, and the Sinwell tower was closed for restoration works. Rather deserted in winter but definitely a must-do in summer: the Artisan’s Yard. On our way to the German National Museum we decided on a short detour to check out the cute Artisan’s Yard. The fully enclosed yard could be found in the shadow of the mighty Frauentor Tower. Since we were visiting in winter, most businesses were either closed or not very busy, but it was easy to imagine how cosy the place would be on a warm summer”s night. The yard enclosed a variety of businesses such as art galleries, shops, restaurants und traditional artisans. The perfect place to buy some very original souvenirs, such as tin toys, leathergoods and handblown glass. Definitely also a good place to enjoy a glass of wine in summer! 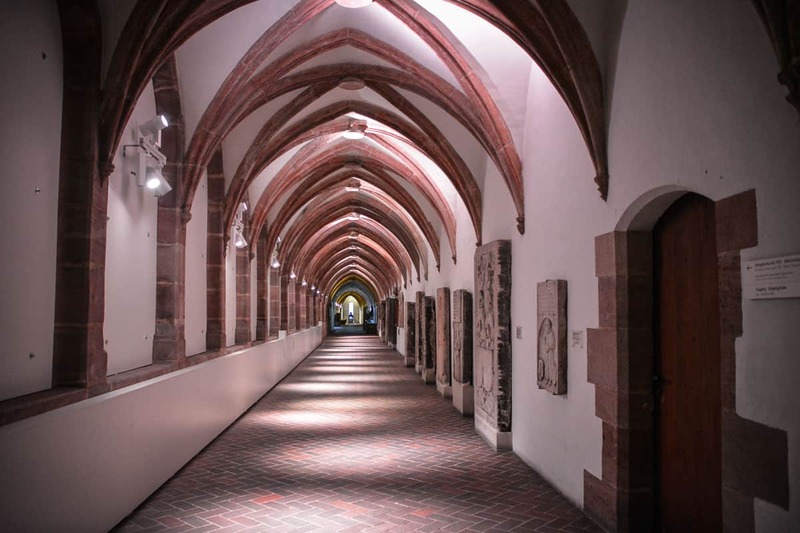 The German National Museum encompasses parts of a medieval monastery. As we were walking to the German National Museum we decided to choose another route than the one we took the day before… not that we didn’t enjoy the red light district but given the choice we wanted to explore another part of the city. So we walked through the city gate to have a look at the park on the other side of the city wall. To our surprise we found a small open art gallery which must be a joy to look at in the summer months when the trees have leaves. Right in front of the German National Museum there was another artsy installation, the Road of Human Rights. We paused for a moment to read the writing on the columns, each one in another language. Once inside the German National Museum we were blown away due to its size. After a quick look at the museum map we realised we needed to set priorities as there was way too much to see on just one afternoon. Accordingly, we focused on those parts of the museum that we were most interested in. We particularly loved the fact that the German National Museum had been built around an old monastery. Part of the experience was the church, the cloisters as well as the cells of the monks. The Nuremberg cellars were once built to store beer. Today, a microbrewery still makes use of a small section of the extensive cellars. One medieval sight in Nuremberg survived despite the extensive bombings by the allies: the beer cellars. In fact, it was thanks to the sturdiness of these cellars that many inhabitants of the city could find shelter during the WWII air raids. Today, visitors can explore the secrets of the cellars on a guided tour. The Felsengänge (literally: rock hallways) were first built in the Middle Ages when a new law required pub owners and breweries to store beers at ideal temperatures underground. Many cellars were built over the centuries, many of them interconnected, so that today you could visit cellars that were up to five levels deep in the rock underneath the city. Tickets for the guided tour in English can be easily bought online. We started with the younger sections of the cellars, although when I say “younger” I mean “WWII”. The entrance to the Nuremberg underworld was restored as a WWII air raid shelter. But very soon we walked deeper into the system, through tunnels and passages until we stood in huge vaulted cellars the size of small houses. Our expert guide explained the in’s and out’s of brewing and storing beer and stressed that we shouldn’t wander off as the cellars had a total size of six acres! Today, the cellars were no longer used for storing beer. Most breweries had moved out of the historic city centre, built huge facilities with modern cooling systems. Just a local microbrewery, Hausbrauerei Altstadthof, used a small part of the cellars to store alcohol for the distillery. One of the three main churches in Nuremberg, St. Sebaldus was the last resting place of the city patron. After our visit to the beer cellars we hit the next Nuremberg attractions. As we had already discovered on our first day, the city had plenty of attractions that one could explore, and it was impossible to do them all in just four days. However, since the doors to St. Sebaldus Church were ajar, we couldn’t help it and had to step inside to have a closer look. You can only imagine how happy our Aussie kids were to find inside the church an ancestral memorial board of a noble Nuremberg family whose last member bid the dust in Australia (Toowoomba, NSW). Another extravagant fountain, the marriage carousel (Ehekarussell) showed typical scenes of relationships between men and women. Who said that travel wasn’t educational? By day 3 we had learned that Nuremberg was a city of weird and wacky fountains. Take the Marriage Carousel, for example. A strange composition with a variety of scenes which showed the ups and downs of married life. We particularly loved the brutal force with which the old wretch made life difficult for her old man. The covered Denkersteg bridge adding a touch of romance to our city exploration. In the background you can just make out the Weinstadel house, Germany’s biggest timber-frame house and the adjoining water tower. We found a touch romance just few steps away in the shape of a bridge which was called Henkersteg. A Henker was the executioner in former times, and his house was located on one end of the picturesque roofed footbridge. In the neighbourhood we found a number of posh shops and boutiques, which added an atmosphere of elegance and sophistication to this part of town. Pellerhaus is still under reconstruction but even today you can get a good idea of the Renaissance splendour that is hidden beside the modern facade. Our last stop of the day was a lesser known Nuremberg attraction, the Pellerhaus. Even though it was not yet featured in most travel guides it was still worth a look. Pellerhaus once used to be one of the most beautiful private Renaissance in Germany. It was almost completelty destroyed in WWII but was currently being rebuilt to show the original splendour. If you didn’t know what you were looking for you would most certainly miss it, because the facade was brutalist modern and looked like any other German office building. However, if you dared to step inside you would be greeted by an architecture masterpiece. At the end of our city trip to Nuremberg we also wanted to visit the Nazi Party Grounds. These were located just outside of the city centre so that it made sense to go there by car right before leaving for Berlin. Inside the old building we found a very well done exhibition on the national socialism in Germany. Even the kids were able to get some of the complex issues thanks to the audio guide. We learned more about the conditions that favoured the rise of national socialism in Germany, the madness of the leader cult around Hitler, the reason why the Nazis seemed to have loved Nuremberg so much in particular, and the fates of many victims like Jews and other minorities in the German Reich. What I only realised when we visited the Nazi Rally Grounds: The monumental building had never been completed, and as such the huge inner courtyard lacked the proposed ceiling that was originally planned for the building. Highly recommended, the Nazi Rally Grounds was today a top class museum and a memorial. Many of our international and German friends were surprised to hear that we took the kids to Nuremberg during the winter school holidays. They had no idea that we would find a city full of romance, history and delicious food… One word of advice: Make sure you wear very comfortable shoes as Nuremberg is big and you get to walk a lot. Also, put your healthy eating habits on halt, it just won’t work this way in Nuremberg. All in all an exciting, inspiring and entertaining trip to a city that is more German than I ever imagined. Important to know: This article was written in collaboration with the local tourism office which gave us free access to all sights for two days. We also received a meal voucher to get us fattened up tempt us with traditional Nuremberg food. We paid for all the other expenses such as travel, accommodation, the entrance fees on the other days as well as meals. I did not receive payment for writing this article, and of course all opinions voiced are my very own.